January 1, 1805 - Fort Mandan, North Dakota - The boat's cannon was set off for New Years; 16 men went up to the first Mandan village and danced. York danced, which amused the Mandans. January 13, 1805 - Fort Mandan, North Dakota - Charbonneau brought news of British North West Company traders speaking against Lewis and Clark in the Mandan villages. Sgt. Gass reported that "indians came in with faces so badly frost bitten that the skin came off." Feb. 11, 1805 - Fort Mandan, North Dakota - Sacagawea gave birth to Jean Baptiste Charbonneau in Fort Mandan, as Lewis recorded: "about five Oclock this evening one of the wives of Charbono was delivered of a fine boy. it is worthy of remark that this was the first child which this woman had boarn, and as is common in such cases her labour was tedious and the pain violent; Mr. Jessome informed me that he had frequently administered a small portion of the rattle of the rattle-snake, which he assured me had never failed to produce the desired effect, that of hastening the birth of the child; having the rattle of a snake by me I gave it to him and he administered two rings of it to the woman broken in small pieces with the fingers and added to a small quantity of water. Whether this medicine was truly the cause or not I shall not undertake to determine but I was informed that she had not taken it more than ten minutes before she brought forth perhaps this remedy may by worthy of future experiments, but I must confess that I want faith as to its efficacy." April 2, 1805 - Fort Mandan, North Dakota - "we are all day engaged packing up Sundry articles to be sent to the President of the U.S." At the end of the winter at Fort Mandan, Lewis and Clark packed up a number of items to send back down the river with a small return party. This was the only en route shipment made to President Jefferson. It consisted of 4 boxes, 1 trunk, and 3 cages. The cages contained a live prairie dog, a sharp-tailed grouse, and 4 magpies. Included in the boxes and the trunk were the pelts, horns, and skeletons of various animals; dried plant, soil, mineral, and insect specimens; Mandan and Hidatsa artifacts and items, and Arikara tobacco and tobacco seed. Labels included the date and place each item was obtained and a brief description. In August 1805 President Jefferson received most of this shipment. He retained some of the specimens and material, and distributed the rest to Charles Willson Peale for his museum in Philadelphia, the American Philosophical Society and to various scholars and specialists. Of the live animals, only the prairie dog and one of four magpies survived the trip. One of the decorated Mandan robes is now at the Peabody Museum, Harvard University. Most of the botanical specimens are today at the Lewis and Clark Herbarium in the Academy of Natural Sciences of Philadelphia. April 7, 1805 - Fort Mandan, North Dakota - "Having on this day at 4 P.M. completed every arrangement necessary for our departure, we dismissed the barge and crew with orders to return without loss of time to St. Louis, a small canoe with 2 French hunters accompanied the barge; these men had assended the missourie with us the last year as engages. The barge crew consisted of 6 soldiers and 2 Frenchmen . . . We gave Richard Warfington, a discharged Corpl., the charge of the Barge and crew, and confided to his care likewise our dispatches to the government, letters to our private friends, and a number of articles to the President of the United States." Corp. Warfington was in charge of the small return party, which included the interpreter Gravelines and Privates Newman, Reed, Boley, Dame, Tuttle, and White. Lewis gave the Arikara chief Kakawita a medal. At 4 p.m., the permanent party of the Corps of Discovery set out for the West with Lewis, Clark, York, Drouillard, Charbonneau, Sacagawea, the baby Jean Baptiste, Sgts. Ordway, Pryor and Gass, and Privates Bratton, Colter, Reubin and Joseph Field, Shields, Gibson, Shannon, Potts, Collins, Whitehouse, Windsor, Willard, Hall, Goodrich, Frazer, Cruzatte, Lapage, Labiche, McNeal, Warner, Howard, Weiser, and Thompson, plus a Mandan man who said he would accompany the group to the Shoshoni nation." April 22, 1805 - The Corps camped in Mackenzie County above modern Williston, North Dakota. The winds were high today; the captains examined the Little Muddy River, and described the country, seeing buffalo and wolves. A buffalo calf followed Lewis for some time along the shore. April 25, 1805 - The camp was across the river from the future Fort Buford (1866), North Dakota, near the Confluence of the Missouri and Yellowstone Rivers. Seaman was out all night, and feared lost, but returned this morning. Another windy day. Lewis decided to take a small party and proceed overland to the Yellowstone River; Clark continued with the boats. "I determined to encamp on the bank of the Yellowstone river which made its appearance about 2 miles S. of me. the whol face of the country was covered with herds of Buffaloe, Elk and Antelopes; deer are also abundant, but keep themselves more concealed in the woodland. the buffaloe Elk and Antelope are so gentle that we pass near them while feeding, without apearing to excite any alarm among them; and when we attract their attention, they frequently approach us more nearly to discover what we are, and in some instances pursue us a considerable distance apparenly with that view." April 29, 1805 - The camp was just past the Big Muddy Creek in Roosevelt County, Montana. Lewis fired on a grizzly bear, which chased him 70 or 80 yards; Lewis' second shot killed the animal. Lewis provided a detailed description of the grizzly and other fauna. Seaman hunted and killed an antelope in the river. Clark walked on shore in the evening and saw a bighorn. May 9, 1805 - The camp was in Valley County, Montana, above modern Fort Peck. The Corps crossed the Big Dry River, whose mouth is now inundated by Fort Peck Reservoir; Charbonneau told Lewis about the best parts of the buffalo for eating an made a sausage called the "boudin Blanc"; Lewis killed four willets. May 11, 1805 - Valley County, Montana, Fort Peck Reservoir, near modern The Pines Recreation Area. Bratton was pursued by a grizzly bear, as Lewis noted: "About 5 P.M. my attention was struck by 1 of the Party runing at a distance towards us and making signs and hollowing as if in distress. I ordered the perogues to put too, and waited untill he arrived; I now found that it was Bratton . . . about 1 1/2 below us he had shot a brown bear which immediately turned on him and pursued him a considerable distance but he had wounded it so badly that it could not overtake him; I immediately turned out with 7 of the party in quest of this monster. we at length found his trale and persued him about a mile by the blood through very thick brush of rosbushes and the large leaved willow; we finally found him concealed in some very thick brush and shot him through the skull with 2 balls. . . these bear being so hard to die reather intemedates us all; I must confess that I . . . had reather fight 2 Indians than 1 bear; there is no other chance to conquer them by a single shot but by shooting them through the brains . . . "
May 14, 1805 - The camp was in Valley County, Montana, above Snow Creek in an area now inundated by Fort Peck Reservoir. The Corps noted huge herds of buffalo, elk, deer, wolves and antelope. Six of the men attacked a grizzly with their rifles; although the bear was hit many times, it continued to pursue them. It took eight balls to kill it. The white pirogue was overset when Charbonneau was at the helm; many valuable articles might have been lost without the clearheaded help of Sacagawea; Lewis and Clark were both on shore at the time. May 26, 1805 - The camp was in Fergus County, Montana, two miles below the mouth of Windsor Creek. The men used the tow lines to pull the boats up the river. Lewis saw the Rocky Mountains for the first time and left a lengthy description of the countryside: "In the after part of the day I also walked out and ascended the river hills which I found sufficiently fortiegueing. on arriving to the summit one of the highest points in the neighbourhood I thought myself well repaid for any labour; as from this point I beheld the Rocky Mountains for the first time these points of the Rocky Mountains were covered with snow and the sun shone on it in such manner as to give me the most plain and satisfactory view. while I viewed these mountains I felt a secret plaesure in finding myself so near the head of the heretofore conceived boundless Missouri; but when I reflected on the difficulties which this snowy barrier would most probably throw in my way to the Pacific, and the sufferings and hardships of myself and party in them, it in some measure counterbalanced the joy I felt in the 1st moments in which I gazed on them; but as I have always held it a crime to anticipate evils I will believe it a good comfortable road untill I am compelled to believe differently." May 31, 1805 - The camp was above the mouth of Eagle Creek in Chouteau County, Montana. The water the men were working in to haul the boats upstream was extremely cold, and their feet were being cut on the rocks. The tow rope for the white pirogue snapped. Lewis gave the men a dram of rum at noon. Lewis described the White Cliffs of the Missouri Breaks and saw Citadel Rock. "The hills and river clifts which we passed today exhibit a most romantic appearance. The bluffs of the river rise to the hight of from 2 to 300 feet and in most places nearly perpendicular . . . the soft sand clifts woarn into a thousand grotesque figures . . . with the help of a little immagination are made to represent the eligant ranges of lofty freestone buildings . . . collumns of various sculpture both grooved and plain . . . with the help of less immagination we see the remains of ruins of eligant buildings." The Corps killed two buffalo, two bighorn, and one elk. June 3, 1805 - Camped on the right side of the river at modern Loma, Montana. The task of the explorers at the Marias was to determine which was the true Missouri River - the right fork, really the Marias River, or the left fork, which turned out to be the true Missouri. At this point, the two rivers looked equally large and either might have been the correct choice. Lewis sent a light canoe commanded by Sgt. Pryor with two others up the Marias, and another light canoe commanded by Sgt. Gass with two more men up the Missouri. Small parties traveled overland to hunt and determine the lay of the land. Both canoes returned by evening. June 8, 1805 - Loma, Montana - Gass recorded that "Capt Lewis returned and the officers concluded that the south branch was the one to ascend." All the men disagreed with the Captains, and felt the north branch - the Marias - was the true Missouri; however, the Captains prevailed, and the Corps continued up the left fork. June 14, 1805 - Clark camped on the left side of the river near Black Coulee, Portage, Montana. Sacagawea and others in the party were very sick. Meanwhile, Lewis with a small party found and explored the Great Falls of the Missouri. "I should have returned from hence but hearing a tremendous roaring above me I continued my rout across the point of a hill a few hundred yards further and was again presented by one of the most beautiful objects in nature, a cascade of about fifty feet perpendicular stretching at right angles across the river from side to side to the distance of at least a quarter of a mile. here the river pitches over a shelving rock, with an edge as regular and as streight as if formed by art, but without a nich or brake in it; the water descends in one even and uninterupted sheet to the bottom wher dashing against the rocky bottom rises into foaming billows of great hight and rappidly glides away, hissing flashing and sparkling as it departs the sprey rises from one extremity to the other to 50 f." Lewis was chased into the river by a grizzly bear. Gass reported that "Capt. Lewis' men returned & informed us that the falls were 20 mi. above." June 17, 1805 - Great Falls, Montana - Not one but a series of five waterfalls were found at Great Falls. All were too large to navigate, and had to be portaged. Clark took five men out to survey the route of the portage, which turned out to be 18 miles altogether; Lewis had the men build trucks and wheels to haul the boats overland. Lewis hunted for elk, to use the skins on his iron collapsible boat. He also gave Sacagawea sulfur water from a spring across the river from the camp. Gass and a party of men hauled the canoes up the Portage or Belt Creek about a mile to the plateau above. June 29, 1805 - Great Falls, Montana - The work of the portage continued. A tremendous hailstorm caught Clark, York, Sacagawea and Charbonneau in the open; a washout in the creekbed nearly drowned them, and Clark lost his fusil, compass, and a number of other articles. Men on the portage route, also caught in the open, reported being pelted with 7½" diameter hailstones which knocked them to the ground and wounded them badly. June 30, 1805 - Great Falls, Montana - The men worked on finishing sewing the skins for Lewis' collapsible boat. In the Great Falls area, food was plentiful. In one sweep of the eye, Clark estimated he could see 10,000 buffalo on the plain. He also saw floating down over the falls many carcasses of animals that had been pushed into the river by those behind them on the steep and narrow trails leading to drinking water. Anticipating that less game would be available in the mountains ahead, they took advantage of the opportunity to stock up on leather clothing. Clark stated: " . . . men Complain of being Soore this day dull and lollong about, . . . Great numbers of Buffalow in every direction, I think 10,000 may be Seen in a view." Lewis lamented that "nearly 3 months have now elapsed since we left Ft. Mandan & not yet reached the Rocky Mtns." July 4, 1805 - Great Falls, Montana - Lewis decided that he would not dispatch a canoe or boat back to St. Louis with journals and scientific information for President Jefferson this season. The Corps celebrated the 4th of July, drinking the last of their liquor today. The men worked on the collapsible boat, Whitehouse reporting that they "finished putting the iron boat together & turned her up to dry." Lewis recorded: ". . . all appear perfectly to have made up their minds to succeed in the expedition or perrish in the attempt. we all believe that we are now about to enter on the most perilous and difficult part of our voyage, yet I see no one repining; all appear ready to meet those difficulties which wait us with resolution and becoming fortitude." July 9, 1805 - Great Falls, Montana - The men could not make Lewis' iron boat watertight, and after days of delay, Lewis finally decided to abandon it and move on. Whitehouse reported that they "concluded to bury her & go 20 mi. up river and make 2 canoes." July 19, 1805 - Gates of the Mountains. The river was getting more rapid; Sacagawea helped in finding food, suggesting the bark of a pine tree. Lewis wrote that "this evening we entered much the most remarkable clifts that we have yet seen. These clifts rise from the waters edge on either side perpendicularly to the hight of 1200 feet... from the singular appearance of this place I called it the gates of the rocky mountains." July 24, 1805 - Camped 7 miles north of modern Tosten, Montana - The men were tired from hauling the canoes upstream, as Clark recorded: "the men complain of being much forteigued, their labour is excessively great. I occasionaly encourage them by assisting in the labour of navigating the canoes, and have learned to push a tolerable good pole in their fraize." Lewis described the flora and fauna of the area. July 27, 1805 - Three Forks, Gallatin County, Montana, Missouri Headwaters State Park. Clark's advanced party was reunited with Lewis and the main party at the Three Forks of the Missouri River. Lewis termed the Three Forks "an essential point in the geography of this western part of the Continent." Within a short distance of each other, three rivers joined to form the Missouri almost 2,500 miles from its mouth. "at the distance of 3 3/4 ms. further we arrived at 9 A.M. at the junction of the S.E. fork of the Missouri and the country opens suddonly to extensive and beatiful plains and meadows which appear to be surrounded in every direction with distant and lofty mountains; supposing this to be the three forks of the Missouri I halted the party on the Lard. shore for breakfast and walked up the S.E. fork about 1/2 a mile and ascended the point of a high limestone clift from whence I commanded a most perfect view of the neighbouring country"
July 30, 1805 - The party began the ascent of the Jefferson River. Lewis walked with Charbonneau and Sacagawea, who pointed out the exact site where she was captured by the Hidatsa. Lewis noted that the river was covered by thick brush and dammed by beavers. Lewis was caught away from the party when darkness fell, and spent a night alone under the stars without a blanket. August 8, 1805 - Sacagawea created a stir of excitement when she recognized Beaverhead Rock. The explorers knew they were close to their goal and redoubled their efforts to find the Shoshonis. Lewis recorded: "the Indian woman recognized the point of a high plain to our right which she informed us was not very distant from the summer retreat of her nation on a river beyond the mountains which runs to the West. this hill she says her nation calls the beaver's head from a conceived resemblance of its figure to the head of that animal. she assures us that we shall either find her people on this river or on the river immediately west of its source; which from its present size cannot be very distant. as it is now all important with us to meet with those people as soon as possible, I determined to proceed tomorrow with a small party to the source of the principal stream of this river and pass the mountains to the Columbia; and down that river untill I found the Indians; in short it is my intention to find them or some others, who have horses if it should cause me a trip of one month"
August 12, 1805 - Lewis went up to Lemhi Pass. Lewis was the first U.S. Citizen to cross the Continental divide. "at a distance of 4 miles further the road took us to the most distant fountain of the waters of the mighty Missouri in surch of which we have spent so many toilsome days and wristless nights . . . here I halted a few minutes and rested myself. two miles below McNeal had exultingly stood with a foot on each side of this little rivulet and thanked his god that he had lived to bestride the mighty and heretofore deemed endless Missouri [A]fter refreshing ourselves we proceeded on to the top of the dividing ridge from which I discovered immense ranges of high mountains still to the west of us with their tops partially covered with snow. I now descended the mountain about 3/4 of a mile which I found steeper than on the opposite side, to a handsome bold running Creek of cold Clear water. here I first tasted the water of the great Columbia river." But Lewis was too optomistic; all he could see were mountains in front of him, not the easy descent down a tributary of the Columbia he had imagined. It would take several more weeks of travel, and Indian horses, to achieve the expedition's goals. August 13, 1805 - Lewis camped near modern Tendoy, Idaho, Clark was west of Dillon, Montana. Lewis and his party accidentally happened onto a native woman and two girls. After calming their fears and convincing them that he was friendly, Lewis persuaded them to lead him to their village. On the way they were met by a band of warriors who had been alerted to their presence. These Indians were the Lemhi Shoshonis. Apparently, their meeting with Lewis was their first direct contact with whites, although they possessed European trade goods that had come to them from other Indians. August 17, 1805 - Clark, leading the majority of the Corps, did not arrive at a pre-arranged rendezvous point when expected. In desperation, Lewis sent George Drouillard and several Indians to search for him. Later, another Indian reported seeing the explorers' boats. Finally, ". . . Capt. Clark arrived with the Interpreter Charbono, and the Indian woman, who proved to be a sister of Chief Cameahwait. the meeting of those people was really affecting, particularity between Sah-cah-gar-we-ah and an Indian woman, who had escaped from the Minnetares [Hidatsas] and rejoined her nation. At noon the Canoes arrived, and we had the satisfaction once more to find ourselves all together, with a flattering prospect of being able to obtain as many horses shortly as would enable us to prosicute our voyage by land should that by water be deemed unadvisable." A conference was held with the Shoshoni, at which Sacagawea served as translator. August 18, 1805 - Near Tendoy, Idaho - On this, Lewis' 31st birthday, he regreted the hours he spent in indolence and swore to accomplish something for the good of mankind. Presents were given to the Shoshoni, who began to bring in horses for the explorers. August 20, 1805 -Lewis made a cache for the superfluous baggage. He recorded information on the Shoshoni and their clothing. Gass stated that "they are the poorest most miserable nation I ever beheld, scarcely anything to subsist on except berries & fish." Clark was at Baker, Idaho, guided by Old Toby, a Shoshoni man. Clark "asked Camehewait by what rout the pierced nose indians, who he informed me inhabited this river below the mountains, came over to the Missouri; this he informed me was to the N., but added that the road was a very bad one as he had informed them and that they suffered excessively with hunger on the rout being obliged to subsist for many days on berries alone as there was no game in that part of the mountains which were broken and rockey and so thickly covered with timber that they could scarcely pass. however knowing that Indians had passed, and did pass, at this season on that side of this river to the same below the mountains, my rout was instantly settled in my own mind, provided the account of this should prove true on an investigation of it, which I was determined should be made before we would undertake the rout by land in any direction." Sept. 2, 1805 - Near modern Gibbonsville, Idaho. The men cut a road northwest of the modern site of this town in a very steep area, where some of the horses fell. ". . . proceded on thro' thickets in which we were obliged to Cut a road, over rocky hill sides where our horses were in pitial danger of Slipping to Ther certain distruction and Up and Down Steep hills, where Several horses fell, Some turned over, and others Sliped down Steep hill Sides, one horse Crippeled and 2 gave out." Sept. 4, 1805 - Near modern Sula, Montana - A very cold morning with snow; the Corps met the "Flathead" Indians, who prefer to be called Salish. The common explanation of the English name is that they were considered flat-headed by tribes on the lower Columbia, who deformed the skulls of their infants to produce a pointed head. Supposedly in the 19th century these mountain "Flatheads" became confused by whites with those who practiced skull deformation, and thus the term was used loosely for many Northwestern tribes. Clark recorded: ". . . prosued our Course down the Creek to the forks about 5 miles where we met a part of the Flathead [Tushepan] nation of 33 Lodges about 80 men 400 Total and at least 500 horses, those people recved us friendly, threw white robes over our Sholders and Smoked in the pipes of peace, we Encamped with them and found them friendly but nothing but berries to eate a part of which they gave us, those Indians are well dressed with Skin Shirts and robes, they Stoutr and light complected more So than Common for Indians, The Chiefs harangued untill late at night, Smoked our pipe and appeared Satisfied. I was the first white man who ever on the waters of this river." They camped with the Indians at Ross's Hole. The Salish assisted the explorers with more horses and directions. Sept. 9 - 12, 1805 - Traveler's rest. 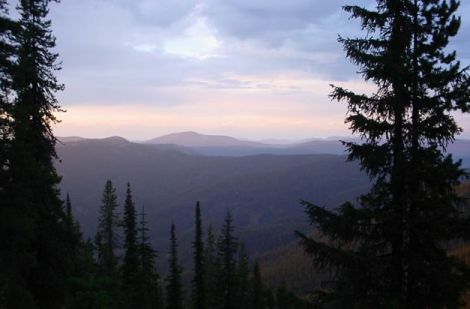 Sept. 13, 1805 - Lolo Pass, Route 12 between Montana and Idaho in Clearwater National Forest. Lewis lost his horse; Clark investigated the hot springs: "I found this water nearly boiling hot at the places it spouted from the rocks." Sept. 14, 1805 - Colt Killed Creek, Idaho. The route over the Bitterroot Mountains took the explorers into some of the worst terrain in the Rockies. This was the most agonizing part of their entire journey. Fallen timber made the trail almost impassable. Pushing up steep hills and rocky mountain slopes, struggling through deep gorges and hollows, and tearing through tangled forest choked with underbrush drained the strength of man and beast. Rations ran short and snowstorms only added to their desperate situation. "I could see no fish, and the grass entirely eaten out by the horses, we proceeded on 2 miles and Encamped opposit a Small Island at the mouth of a branch on the right side of the river which is at this place 80 yards wide, Swift and Stoney, here we wer Compelled to kill a Colt for our men and Selves to eat for the want of meat and we named the South fork Colt killed Creek, and this river we Call Flathead River - The Mountains which we passed to day much worst than yesterday the last excessively bad and Thickly Strowed with falling timber and Pine Spruc fur Hackmatak and Tamerack, Steep and Stoney our men and horses much fatigued." Sept. 18, 1805 - The Corps camped three miles west of Bald Mountain. The Corps was at low ebb for provisions. They broke out the cans of portable soup and ate some, although the men detested it. Lewis even noted that their provisions consisted only of bear's oil and 20 pounds of candles, which they were apparently prepared to eat if they ran any lower on food. Sept. 20, 1805 - The camp was between Dollar and Sixbit Creeks, Idaho. In order to get through the Bitterroots Lewis and Clark split the party, with Clark and six men pushing ahead. Clark emerged from the wooded mountains at Weippe Prairie and encountered the Nez Percés. ". . . descended the mountain to a leavel pine Countrey proceeded on through a butifull Countrey for three miles to a Small plain in which I found maney Indian lodges, . . . Those two Villages consist of about 30 double lodges, but fiew men a number of women and children; They call themselves Cho pun-nish or Pierced Noses . . . "
Sept. 22, 1805 - Weippe Prairie, Idaho. Lewis and the rest of the men caught up to Clark with the Nez Percé. Lewis and Clark explained their mission to the Nez Percé and requested assistance in building canoes so that they could proceed onward by water. By October 6 the canoes were completed and they were on their way. During their brief stay with the Nez Percé, Lewis and Clark observed that their culture was advanced, and that they were very friendly. In time, the two leaders came to feel the Nez Percé were the most likable and hospitable of any native group they encountered. October 10, 1805 - Modern Clarkston, Washington. The Captains wrote information about the Indians and made lunar observations. "The Cho pun-nish or Pierced nose Indians are Stout likely men, handsom women, and verry dressey in their way, the dress of the men are a white Buffalow robe or Elk Skin dressed with Beeds which are generally white, Sea Shells - i e Mother of Pirl hung to ther hair and on a pice of otter Skin about their necks hair cerved in two parsels hanging forward over their Sholders, feathers, and different Coloured Paints which they find in their Countrey Generally white Green and light Blue. Some fiew were a Shirt of Dressed Skins and long legins, and Mockersons Painted, which appears to be their winter dress, with a plat of twisted grass about their necks." October 13, 1805 - 7 miles northwest of modern Starbuck, Washington at Lyons Ferry State Park. It was noted by Clark that Sacagawea was a token of peace for all Indians encountered on the journey. October 16, 1805 - Sacagawea State Park, modern Pasco, Washington. Pryor's canoe struck a rock while running the rapids; the Corps reached the junction of the Snake and Columbia rivers. The Indians danced around the Corps, who smoked with them and traded for food. October 19, 1805 - The camp was across the Umatilla River from Umatilla, Oregon. Hat Rock State Park, was sighted by Clark. The Captains gave a medal to a chief. Cruzatte played his fiddle, which delighted the Indians. A long description of Indian customs was included in the journal. October 21, 1805 - Camped near the site of modern John Day Dam, Washington. Collins made beer from roots. The Corps bought wood and breakfast from the Indians. October 25, 1805 - Moved up to the "Fort Rock Camp" at The Dalles, Oregon. The men rode the canoes down the rapids, and broke out into a calm, wider portion of the river. Nov. 3, 1805 - The Corps camped on Diamond Island, three miles west of modern Camas, Washington - As the Corps made their way down the river, they were accompanied by Indian friends and guides. Pvt. Whitehouse recorded: "we proceeded on the River verry wide better than a mile in general. a number of large Island &c towards evening we met Several Indians in a canoe who were going up the River. they Signed to us that in two Sleeps we Should See the Ocean vessels and white people &c &c."
Nov. 7, 1805 - Camped opposite Pillar Rock, between Brookfield and Dahlia, Washington, west of Jim Crow Point. "Great joy in camp we are in view of the Ocian this great Pacific Ocean which we been so long anxious to See. and the roreing or noise made by the waves braking on the rockey shores (as I Suppose) may be heard distinctly." Although they were really only seeing the Columbia Estuary, the men of the Corps were certainly happy to be near their goal. Nov. 15, 1805 - Lewis reached the Pacific Ocean. Clark noted that it rained until 3 p.m.; there were 11 straight days of rain; he moved camp once more to Haley's Bay, where they stayed until November 24. Nov. 23, 1805 - Near modern Fort Columbia State Park, Washington. Today the famous vote was taken on where to spend the winter; every member of the party got to vote, including Sacagawea and York. The Corps voted to cross to the Oregon side of the river where there were reputed to be more elk and a site along the seacoast to make salt could be established. Dec. 9, 1805 - Near modern Seaside, Oregon, a saltmaking cairn was established. Gass wrote that they "found the ocean 7 mi. from camp, hunters killed an elk & saw 50 more." Dec. 25, 1805 - Fort Clatsop, Oregon. The explorers celebrated Christmas; all the men were in their huts and exchanged gifts; they had a bad Christmas dinner. Clark recorded: "at day light this morning we we[re] awoke by the discharge of the fire arms of all our party and a Selute, Shouts and a Song which the whol party joined in under our windows. after which they retired to their rooms were chearfull all the morning. after breakfast we divided our Tobacco which amounted to 2 carrots one half of which we gave to the men of the party who used tobacco, and to those who doe not use it we make a present of a handkerchief, The indians leave us in the evening all the party Snugly fixed in their huts. I recved a present of Capt. L. of a fleece hoserie Shirts Draws and Socks, a pair Mockersons of Whitehouse a Small Indian basket of Gutherick, two Dozen white weazils tails of the Indian woman, and some black root of the Indians before their departure"
January 1, 1806 - Fort Clatsop, Oregon - This New Years day was a miserable one for the Corps; they could look forward only to New Years 1807 and hope it was better. Soaked with rain and plagued with fleas, with little fresh meat and less palatable food, they were indeed miserable. Even the feast of New Years was composed of the usual elk meat with wapato root washed down with water. With little to do except try to obtain the necessities of life, Lewis' journal entries turned more and more to long descriptions of the Indians and plant and animal life. A recurring entry stated that "Nothing of consequence happened today." General Orders establishing military discipline in the fort were issued today. January 8, 1806 - At modern Ecola State Park, Oregon, Clark and a small party saw a whale that had washed up on shore, which was nothing but a skeleton by this time, the Indians having used every part of the animal. March 23, 1806 - Fort Clatsop, Oregon - Clark recorded that ". . . we loaded our canoes and at 1 P.M. left Fort Clatsop on our homeward bound journey. at this place we had wintered and remained from the 7th of December 1805 to this day and have lived as well as we had any right to expect, and we can say that we were never one day without 3 meals of some kind either pore Elk meat or roots . . . " Drouillard and a party of hunters were sent out ahead, and the two pirogues and three canoes began the return voyage up the Columbia River. Copyright 1998, LewisAndClarkTrail.com - all rights reserved. LewisAndClarkTrail.com and "Re-live the Adventure" are trademarks.